King's Acre Pippin has the typical flushed orange autumnal tones of the traditional English apple. It is a very-late season apple, often not ripening until the end of October or early November. Although related to Ribston Pippin and having some of the appearance of that variety, it inherits the crisp dense sharp-flavoured flesh of its other parent, Sturmer Pippin. Please fill in the details below and we will let you know when King's Acre Pippin apple trees are back in stock. King's Acre Pippin is self-sterile and needs to be pollinated by another tree of a different variety nearby. King's Acre Pippin has the strong vigorous growth of a triploid variety. It is unusually late ripening for an English variety - probably inherited from its Sturmer Pippin parent. It is therefore probably best grown in the south and east of the UK where it can benefit from the longer autumn ripening period. Developed at King's Acre Nurseries of Hereford and introduced in 1899. 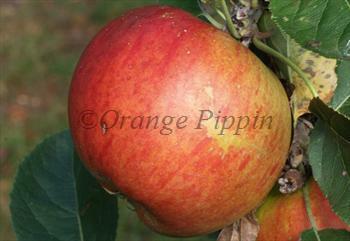 King's Acre Pippin is believed to be a cross between Sturmer Pippin and Ribston Pippin.